It’s hard to think of winter crops when it barely feels like winter is over. But, many of my winter garden crops are started right alongside my summer crops. One of our staples is celeriac or celery root. 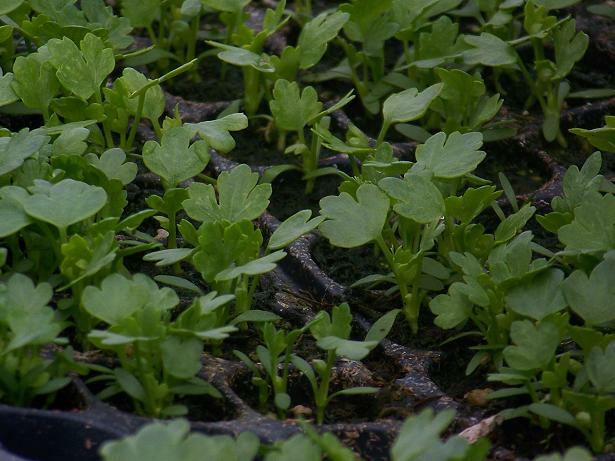 It stores well, and besides the bulb, the leaves and stalks are very handy for celery flavoring in winter dishes. Celery root is a slow grower, and tender at first, so I start these in late February or early March for setting out in the garden in June. I like a 200 cell flat for these small seeds, they are very slow-growing at first, and when they have their first true leaves you can transplant them. Today I transferred these to 6 packs, or 48 cells per flat. By June they will be the perfect size for setting out in the big, scary world of the garden, where they will stay until I harvest them as needed in the winter. Celeriac has quite an extensive root system, if you haven’t grown them you will not have any idea of how many fleshy roots the mature bulbs have anchoring them in the soil. However they grow slowly and are easy to separate if you have two in a plug. Potting up plants is a production oriented task. 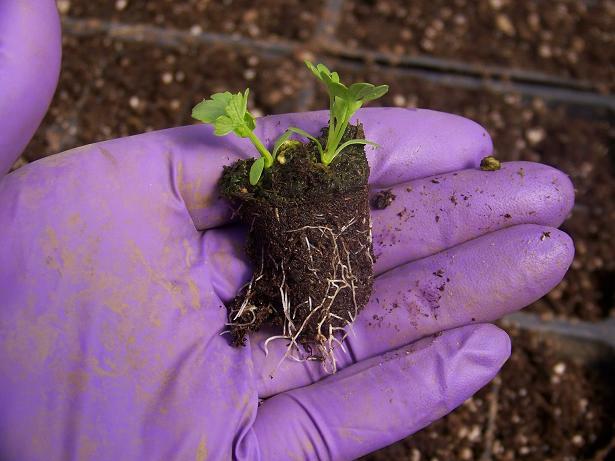 ♥ Have your potting soil moist, but not wet. The easiest way to do this is to water the bag of soil the day before you plan to pot up, and keep the top closed. Dry soil is a no-no on tender roots. 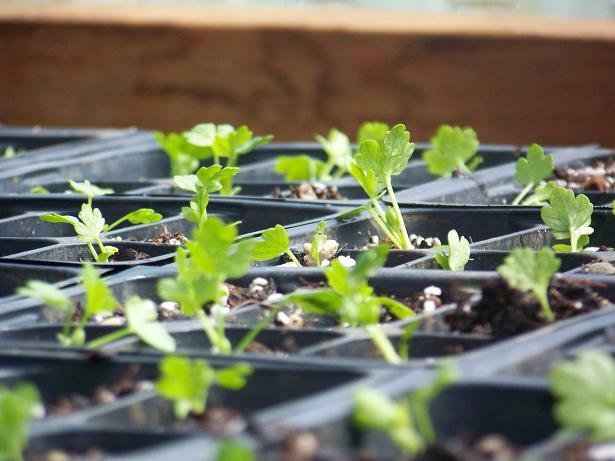 ♥ Make sure your flat of starts is well watered and drained before beginning to transplant. ♥ Have all your pots and flats ready – counted, and filled with your potting soil. I fill mine level full, and drop them several times to settle the soil, and add more as needed. You still may need to add a little soil as you go. 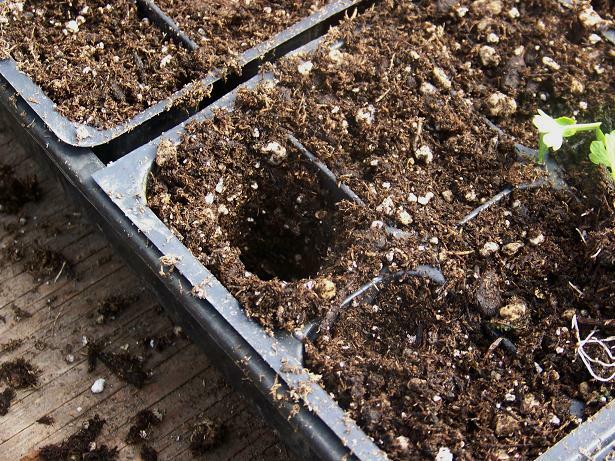 ♥ Divide your plants as needed, and using a dibble (I use my fingers or butter knife) make a hole for the plug. Just like planting a tree, make the hole a little larger than needed, so you can drop in the plant without damaging the root system. ♥ Water well until the flats drip, check at this time for settling and add more soil as needed, and you’re done. I didn’t have the luxury of Ruthless taking photos, so it was hard to take photos and pot up at the same time. So I took a couple of videos to show that you don’t have to too careful, just slow, steady and methodical. MOH- I have nine (I think) celeriac in the outside planter and they’re doing well, but I’m thinking I should have planted more. I’m at a lower elevation than you- do you think I still have time to start some more celeriac seed? Oh you put me to shame!!!! I have so few! What kind of light will they get now? I’m such an amateur at this. I apologize that this has nothing to do with this post. I’ve tried leaving a comment on Simple Green Frugal Co-Op without success. Regarding your husbands digestive prolems: Have you ever tried food combining? I ask because I’ve suffered with digestive problems off and on for years. In the past year and a half they became chronic, acute and debilitating. Doctors were more a source of frustration than help and it became obvious the answer was to do my own research. In the past month since starting a food combination diet, the results are unbelievable. I hate to say miraculous; however ,comparing the way I feel now to the way I felt a few months ago, it’s the best word to use. If you’re at all interested I’d be happy to share my experience and research with you. I have nothing to sell, I sincerely want to help if I may. I never planted celeriac before, I really must try that. I use this root to make remoulade. The whole family just love it. Oh. My. Gosh! You made a video! Two videos! I’m so impressed; I watched them twice! 🙂 I think I’ve seen videos here before, but I don’t think they were of you (or your hands, that is). The use of video is such a great idea, especially for tutorial junkies like me. Seriously, this was a cool post. I like watching the videos from Territorial Seed Company, but they don’t show close ups like yours. Would love to hear your voice, too, or do you prefer to remain more mysterious? 🙂 PS: Like your coffee can and your gloves! 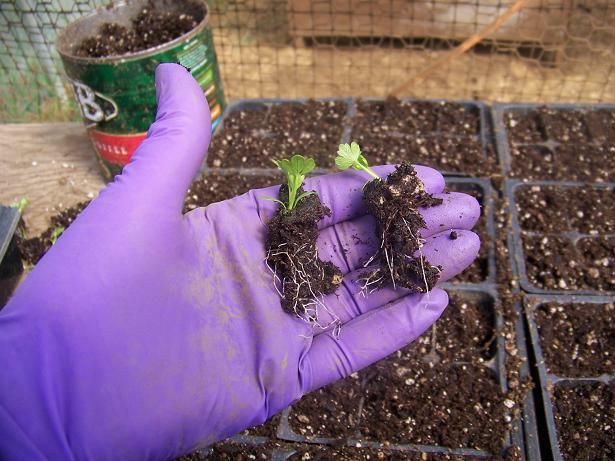 I have been transplanting seedlings for days! Direct planting is so much faster! I think I will do more direct planting, when possible, next year.